No luck in finding a circuit diagram for one of these things. power a "Time Flux Capacitor" needs in order to operate: 1.21 Jigawatts! Since overanalyzing things is a cherished geek tradition, let's dig in to that number. First off, we need to establish what the heck they're saying. I had always assumed that the "jigawatt" was a made-up unit, chosen to sound science-y, but in a lazy, lighthearted way that poked fun at the sci-fi genre. However, some of the other folks around the office were under the impression that it was simply a deliberate mispronunciation of "gigawatt"—referring to the actual unit, but mispronounced to make it clear that the film wasn't taking itself seriously. A late draft of the film's script answers this part of the question: it's spelled "Jigawatts", presumably meaning it's a made-up unit. Bizarrely, though, this doesn't really settle the issue—Merriam Webster's pronunciation guide lists "jigawatt"—spoken as though it starts with a "J"—as the proper pronunciation for the actual SI unit of power, the gigawatt. By this logic, we can assume that the film's characters are talking about the actual unit, so we'll run with that because it lends itself to calculation. So how much power IS 1.21 gigawatts—would we really need a lightning strike to activate something with that kind of power threshold? It's important to remember the units we're working in: a watt is the unit of power, energy per second. 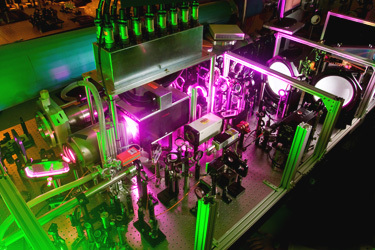 Although "giga-" is the prefix corresponding to "billion" or 109, there are lasers with gigawatt power outputs that actually transfer a very small amount of energy; they just do in a pulse that lasts less than a billionth of a second. Like these lasers, it's not that a Time Flux Capacitor needs a tremendous amount of energy, it just needs energy at a tremendously high rate. The formula for power in a circuit, P=I*V (or P=I2*R), makes it clear why this is a huge hurdle: the voltage necessary to create that kind of current, even in a relatively low-resistance circuit, is extraordinary. But how does that compare to the cloud-to-ground current of the average lightning strike? According to the IOP's physics.org page, a single lightning strike dissipates about 5 billion joules of energy—a promising sign, as we're back in the range of "giga-" prefixes, and even moreso because we know that a lightning strike takes less than a second, on average. With 5 gigajoules of energy dissipated over the ~30 microsecond duration of the average lightning strike, it looks like the average bolt supplies about 170 terawatts of power. Even if 99% of that power is lost as heat to the atmosphere, the clocktower lightning strike would still supply more than enough to launch Marty back to the future, with a factor of about 1000 left over for resistive losses on the way from the tower to the Delorean. Unfortunately, the same energy-power-time relationship that makes it possible to generate a petawatt laser pulse makes the enormous power of a lightning strike practically unusable for anything outside the realm of sci-fi technology. Current densities that high can actually alter the characteristics of the materials they flow through, increasing a conductor's resistance and making it virtually impossible to harvest the force of a thunderstorm. Curiously enough, WolframAlpha has a range of 1.0-1.2 gigawatts listed for "power output of a typical commercial single-unit nuclear power plant", so perhaps Doc Brown was onto something with his fuel source—then again, perhaps not—a coal-fired plant puts out just as much power: if they'd missed the lightning strike, shorting Hill Valley's entire power grid might have been enough to kick the flux capacitor into gear. So enjoy "future day", re-watch the films if you're a fan, debate the definition of a jigawatt with your friends, and join us as we patiently await a hoverboard that performs as promised. A little digging around on the interwebs reveals the screenwriters intended to use real unit but were unaware of the (preferred?) hard g pronunciation and spelled it phonetically in the script.